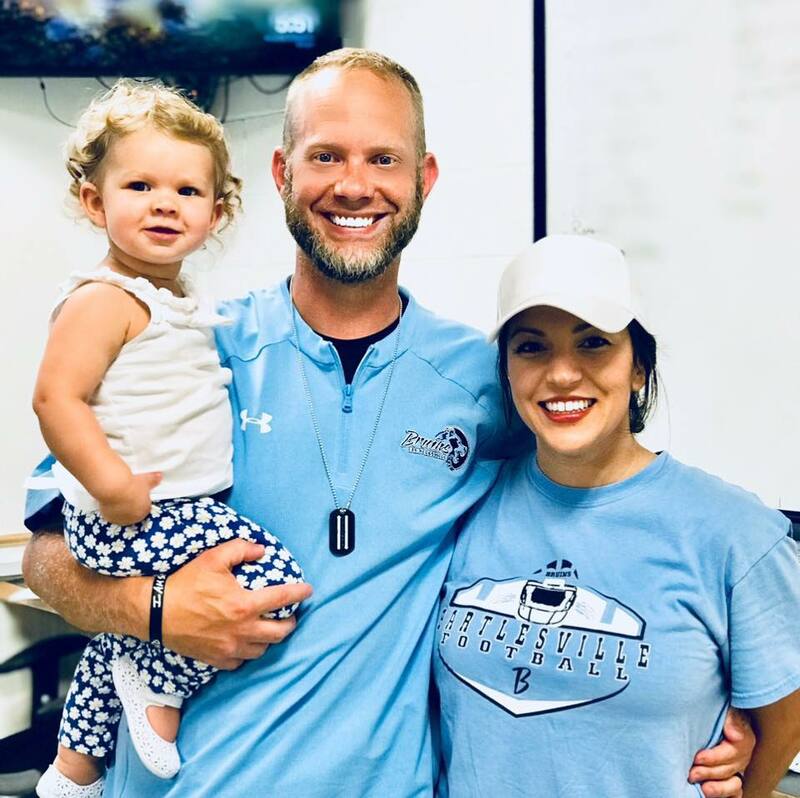 Jason Sport enters his first season as the Head Coach of the Bruins after spending 2018 as the Defensive Coordinator at Bartlesville High School. Sport came to Bartlesville with 15 years of high school football coaching experience, including two seasons (2016-17) at Jenks High School under Hall of Fame Coach Allan Trimble. He served as the Special Teams Coordinator and Defensive Backs coach. Sport helped lead the Trojans to the Oklahoma Class 6A-1 State semifinals in both years. 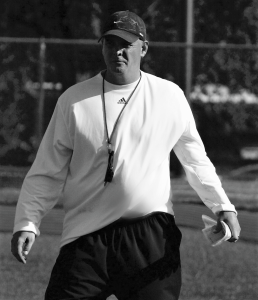 Sport also served as Special Teams Coordinator and Defensive Line coach at Lincoln Christian School in Tulsa, OK. In the four seasons (2012-2015) that he spent with Lincoln Christian, the Bulldogs finished as Oklahoma Class 3A State runner-up once and made an appearance in the quarterfinals twice. In two seasons (2010-11) at Greenwood High School in Arkansas, where he was tutored under Hall of Fame Coach Rick Jones, Sport was a part of two Arkansas Class 6A state championships. Those Greenwood teams set an Arkansas state record with 50 wins in a row. Sport coached quarterbacks and defensive backs. Sport served as the Defensive Coordinator at Sapulpa High School for 7 seasons (2003-09) where he was a part of one of the biggest upsets in Oklahoma playoff history. His Sapulpa team knocked off number one ranked Jenks in the 2005 first round. Sport, 39 and an Alabama native, received his bachelor’s degree from Northeastern State University in Tahlequah, OK. He and his wife, Ruth, have four children: Braylon (13), Caydon (12), Addiley, (9) and Chloe (1). Bruin football has added the offensive coordinator title to associate head coach Jason Munoz’s duties for the 2019 season. Munoz begins his second year on the Bruin staff with high expectations after a successful 2018 campaign in which the Bartlesville offense put up its best numbers in years. Munoz boasts more than 20 years of play-calling experience at the college and high school level. He has tutored and developed many college and NFL players, including the 2004 Harlon Hill Trophy winner (NCAA Division 2’s equivalent to the Heisman Trophy) Chad Friehauf and 2015 Oklahoma Player of the year Micah Wilson. Munoz, arrives in Bartlesville after serving the last 7 seasons at Lincoln Christian School in Tulsa. 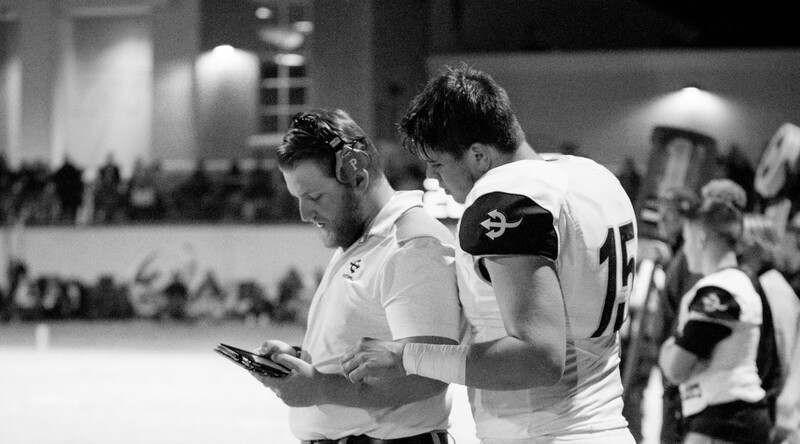 During his 7 seasons at Lincoln Christian, Munoz oversaw a balanced pro-style offense that produced some of the most impressive seasons in Lincoln Christian school history and led the state of Oklahoma in many categories. In 2015 Munoz’s team finished as Oklahoma class 3A state runner-up. Munoz’s offense led the state of Oklahoma in scoring at 52 per game as he tutored OK Prep Player of the Year Micah Wilson, currently playing QB at Missouri. Wilson threw for over 3700 yards with a 71% completion rate while tossing 56 touchdowns to only 2 interceptions. The Bulldogs made the playoffs in each of Munoz’s 7 seasons with 5 quarterfinal appearances to go along with the state runner up. Before coaching in high school, Munoz was the offensive coordinator at Tarleton State University where he coached quarterback Scott Grantham. Grantham ended his TSU career throwing for 8,031 yards, second most in school history. His offense also produced the school’s first 1000-yard rusher in many years. Munoz, offense was 2nd in the Lone Star Conference that year and had 7 all conference players to go along with one All-American. Munoz spent the 2007 season as the offensive coordinator for the Northeastern State University Riverhawks in Tahlequah, OK. His offense improved red zone scoring percentage by 40% over the previous year, up to 77% that season and produced 3 all conference players. Prior to the 2007 season, Munoz spent 3 years as the offensive coordinator for Colorado School of Mines in Golden, CO. The 2004 CSM team took the D2 football world by storm producing the school’s first undefeated regular season and a deep playoff run that ended in the national semi-finals. Munoz’s offense was one of the most efficient in the country, which lead to his quarterback being named Division 2 National player of the year. QB Chad Friehauf threw for 4,646 yards, 39 touchdowns, and ran for 15 more touchdowns. Chad also set the division 2 record for completion percentage in a season at 74.4% and school record for most consecutive passes thrown without an interception at 180. Munoz team finished the year with a 12-1 overall record. During the spring of 2004, legendary football coach Tommy Kaiser brought Munoz to Buffalo, NY to work for the Buffalo Bills. Munoz served as an offensive/special teams intern with the Bills where he worked with quarterback Drew Bledsoe, running backs Willis McGahee and Travis Henry. After working as a student assistant/offensive G.A. at Oklahoma State University under former National Champion Coach Les Miles, Munoz landed his first offensive coordinator position at California Lutheran University in Thousand Oaks, CA. While at Cal Lutheran, Munoz offense set school records in points scored in a game, passing yards in a game, individual passing yards in a season, individual rushing yards in a single game and individual receptions in a game. Munoz, 42, spent 3 seasons playing wide receiver and returner at Benedictine College in Atchison Kansas before transferring to Oklahoma State University in Stillwater, OK where he received his bachelor’s degree. Bobby Holmes has been welcomed back home to Bartlesville for his second coaching stint with the Bruins. Holmes will serve as the Special Teams Coordinator as well as coaching running backs on the high school staff for the 2018 season. 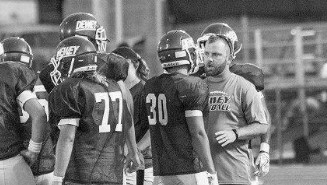 Holmes has spent the last 3 seasons as the offensive coordinator at Dewey High School. Holmes Bulldoggers offense improved each year under his tutelage posting well over 3000 yards per season. His offense produced a 2,000 yard rusher and 1,000 yard receiver in the same season, a rarity for high school football. His 2016 squad broke into the playoffs amidst one of Oklahoma Class 3A’s toughest districts. Holmes previously spent 7 seasons coaching at Bartlesville. During his first stint, Holmes coached the Bruin secondary for 2 seasons before switching to the offensive side of the ball where he led the Bruin wide receiver corps for 5 seasons. Holmes has coached several notable Bartlesville football players including- Mike Thompson (NEO), Garrett Powell (NEO/Northwestern Oklahoma State), and Trevor Moll (Southern Nazarene). Holmes, 34, received his bachelor’s degree in History Education from Oklahoma State University in Stillwater, OK. Holmes met his wife Tiffany while attending OSU. He and Tiffany have been married for 10 years and have a son, Landry, who is 8 years old. 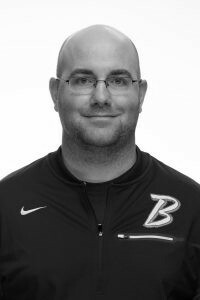 Tanner Koons begins his first season with the Bartlesville Bruins program in 2019 as the Defensive Coordinator and safeties coach. An elite motivator and developer of talent, Koons brings a proven track record to the Bruin staff. Koons arrives in Bartlesville after one season as the defensive coordinator, strength & conditioning coordinator, and linebackers coach at Perry High School. In Koons lone season with Perry, he led the Maroon defense to one of the biggest turnarounds in school history. Perry, 4-6 in 2017, needed to be rejuvenated on the defensive side of the ball. The 2018 version looked and played much different. Perry finished the regular season 8-2 and won the district championship. The Maroon defense allowed half as many points in 2018 as they had in 2017. Koons spent seven seasons at the University of Central Oklahoma prior to his stint with the Maroons. The 2016 & 2017 seasons, Koons served as the UCO linebackers coach, under Nick Bobeck, where he help led Bronchos to a 4th place finished in the MIAA Conference, a 7-4 record, and win in the Corsicana Bowl. Koons was a four-year lettermen and starter at linebacker, finishing with 131 career tackles while playing in 42 games for the University of Central Oklahoma. Koons finished his junior and senior campaigns 15-7, earning the Broncho’s two bowl berths. Koons, 26, was a three-sport standout at Tuttle High School while growing under the tutelage of his father, Phillip Koons. Tanner was named District MVP & 3A All Star in football. He earned All-Conference honors in basketball and was a two-time regional champion in the 110-meter hurdles. Returning for his second season, Bartlesville High School is blessed to have one of Oklahoma’s most dynamic, young, wide receiver coaches, Prince McJunkins. In McJunkins first year, the Bruin wide out corps improved dramatically amassing over 1500 yards receiving. A bright spot on the 2017 squad, McJunkins position players averaged 12 yards per catch and he also had a senior average 100 yards receiving per game. Considered by many to be a kid magnet, McJunkins has helped lead the way in recruiting players from the hallways of Bartlesville High. The numbers on the 2018 team have continued to increase throughout the spring. McJunkins spent his first year of college football with Georgia Southern, helping the Eagles advance to the national semifinals before falling to eventual national champion North Dakota State. McJunkins finished out his playing career at Northeastern State University. In 3 seasons at NSU, McJunkins played wide receiver, finishing as one of the top performers on his Riverhawk team. He also returned kickoffs averaging over 20 yards per kick return. Though he did not play quarterback, he did finish his college career with 100% complete rate and tossed one touchdown. McJunkins had a stellar high school career, playing quarterback and safety under future HOF coach Dale Condict at Wagoner. McJunnkins senior campaign produced one of the best seasons in school history. In 2010, McJunkins led Wagoner to a 13-1 record and a berth in the class 4A State title game. His team averaged over 40 points per game and only gave up 9 points per contest. He also earned the “Ford Award” player of the year, Channel 2 player of the year, and was named to the Oklahoma Football Coaches All-State team After helping to lay the foundation for the Bulldog program, Wagoner went on to win 4 state titles in 6 years. McJunkins, 26, received his bachelor’s degree in Health and Human Performance from Northeastern State University in Tahlequah, OK.
Robert Clark joined the Bartlesville High School football coaching staff in January of 2018, and coaches the slot receivers. Clark spent the 2017 season coaching quarterbacks at Beggs high school. Clark helped lead Beggs to a 13-2 record and the school’s first state championship appearance in 40 years. On the way to the Oklahoma Class 3A State Runner-up, Clark’s quarterback set an Oklahoma playoff passing record by throwing for 581 yards in the semifinal game vs. Sulpher. Beggs quarterbacks threw for over 2800 yards with only 4 interceptions in 15 games. Prior to the 2017 season, Clark spent one season as the offensive coordinator and quarterbacks coach at Gore high school. Clark led the young Pirate offense to an impressive season ending with his quarterback being named 1st Team All-District. Clark played college football at Hendrix College in Conway, Arkansas. His 2014 Warriors team posted the highest win total since 1937. That season was followed up by winning the Southern Athletic Association Conference Championship, which sent Hendrix to the NCAA Division III playoffs for the first time in school history. Clark played his high school football for Coach Lee Blankenship at Gore high school. Clark led the Pirates to the playoffs in each of the years that he played under Coach Blankenship. Clark also set school records for passing yards, completion percentage and touchdowns in a career. He was named All-Conference and finished as the quarterback of the year in the district. Harley Rutherford begins his 11th year coaching football for Bartlesville. Coach Rutherford steps into a new role for the Bruins as he becomes the Inside Linebackers coach for the high school team. 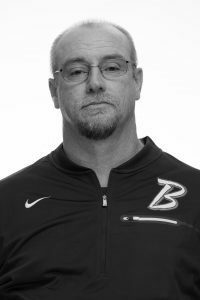 Coach Rutherford began his career at Bartlesville as an 8th grade assistant coach in 2008, later becoming the head coach. During his time with the 8th grade, Coach Rutherford amassed a 69-23 record. He continued in this role until becoming the freshman head coach in 2017. Coach Rutherford’s passion for coaching began with coaching his son as a third grader. That volunteer position led to becoming the finance and program director for the Bartlesville YMCA. 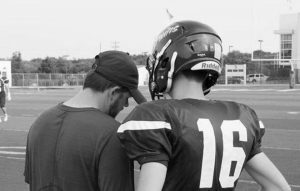 During his 8-year tenure, he grew the youth football program from 140 players (9 teams) to 320 (17 teams), which continues to be the highest participation in the program’s history. Coach Rutherford has been a football commissioner for the Indian Nations Youth Football Conference for 13 years. The INFC, headquartered in Broken Arrow, boasts a membership of 37 clubs that is made up of approximately 9000 players across Green Country. 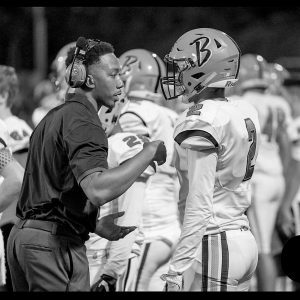 He has served as the Director of Player Safety for 5 years partnering with USA football to provide training and certifications for the youth coaches. In this capacity, he has attended the USA Football National Convention twice. In addition, he is the 7 on 7 commissioners and the INBC basketball director. Strengthening school programs continues to fuel his passion for growing youth sports in the community. In addition to coaching football, Coach Rutherford has coached JV baseball and Junior High tennis. Coach Rutherford is currently a PASS/BOT director for Bartlesville High School. Nathan England begins his second year coaching for Bartlesville. Coach England will coach defensive backs on the high school team, as well as taking over as the head freshman coach. Coach England began his football coaching career at Wesleyan Christian High School in 2010, serving as head coach for six seasons. As head coach at WCS he led the team to its first ever OSSAA playoff appearance in 2012 and the only Playoff win in school history. Set a school record for wins in a season in 2012. The WCS team was 1-9 the season prior him being hired as head coach. With 11 players named to all-district honors, (4 of which did not play football before 9th grade,) 1- all-district offensive player of the year, 1- 8 man all-star selection, 5 alternate selections. Coach England attended Oklahoma Wesleyan University 2003 – 2007 receiving a degree in pastoral ministry. He was a four year starter on the baseball team as a pitcher. While and OKWU he met his wife Jennifer and they have been married 10 years. Jennifer is a 5th grade teacher in Bartlesville at Ranch Heights Elementary. They have two children, a son Ethan who is 7 years old and a daughter Kate who is 4 years old. 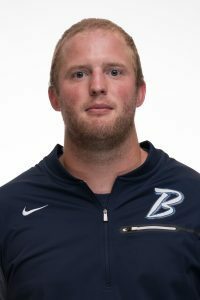 Daniel West enters his third season as the Strength and Conditioning Coordinator for Bartlesville High School. West has worked with all Bruin sports for the last year and has worked closely with the Bruin Swim team for two years. In that time, West was instrumental in helping the Bruins swim team win numerous events at the Oklahoma 6A State Championships, as well as set 7 State records (2016), develop 10 National All-Americans (2016), and help send 2 swimmers to the 2016 US Olympic Trials. West, along with his wife and baby daughter, Co-own and coach a local CrossFit and Sports Performance Gym. In the last two years, West has developed several athletes who have gone on to achieve remarkable success including: 5 National Qualifiers, 6 Invitation-Only Qualifiers, 2 World Qualifiers, 12 State Records, 7 American Records, 4 State Gold Medalists, 2 National Gold Medalists, and 1 World Silver Medalist. In addition to performance training, Daniel also spends a good amount of time writing programs and working one-on-one with Back to sports clients/athletes that are recovering from injuries. Joshua Wolfe begins his 2nd year as the Bartlesville Head Eighth grade coach. Wolfe has been a valuable member of the Bruin staff as the number of players he produces continues to grow. Wolfe has 11 years of coaching experience at both the varsity and junior high level. In those 11 years, Wolfe has had more than 50 former players go on to sign scholarships to play at the college level. Wolfe spent 2015 & 2016 seasons as an assistant coach at Caney Valley High school in Caney, KS. He helped led CVHS to the playoffs in both seasons, with 2016 ending in the 3rd round. Prior to 2014, Wolfe was the varsity wide receivers coach at Bartlesville. His first stint with the Bruins was the 2013 & 2015 seasons. He coached the leading receiver in the state of Oklahoma, Slade Nordic, who finished the 2013 season with almost 1400 yards and 15 TD’s. Wolfe was also part of the 2014 team that made the 6A playoffs. From 2007-2012, Wolfe was the head eighth grade coach at Alvin Junior High. His teams produced one undefeated seasons as well as two league titles. Wolfe played his high school football at Galveston Ball high school in Galveston, TX. He was a multi-sport letter winner and was first-team all-district in soccer. Wolfe, 33, received his bachelor’s degree in Kinesiology from Texas A & M University in College Station, TX. Joshua and his wife Megan have one son, Dax.